Polifactory China | This is our fourteenth “Urban Experience” in Shanghai, with which we intend to show the changes the city has undergone over time, and done understanding the urban morphology. We look at each street from an architectural, urban and historical viewpoint. Introduction | This experience is not very common in city´s daily life, crossing from west to east across the “Former French Concession”, joining those who today are the districts of Xuhui, Luwan and Huangpu ends. The beginning of the experience is at the junction of this road with the famous Hengshan Road, where we have completed or begun our Urban Experiences 03 and 06 so that there is a continuity in this visual research and work. Also during the experience, you will come across as a sewing experiences with the streets Shaanxi and Huangpi (Urban experiences 11 and 12), and will end in Huangpu very close to the ancient Chinese city of Shanghai, where we walked the perimeter in the Urban Experience 02 through Renmin Road. From the starting point shots are taken every 200 meters, or whenever there is a significant change of the urban landscape. The scale of the street is quite similar. Length: 4,400 km. 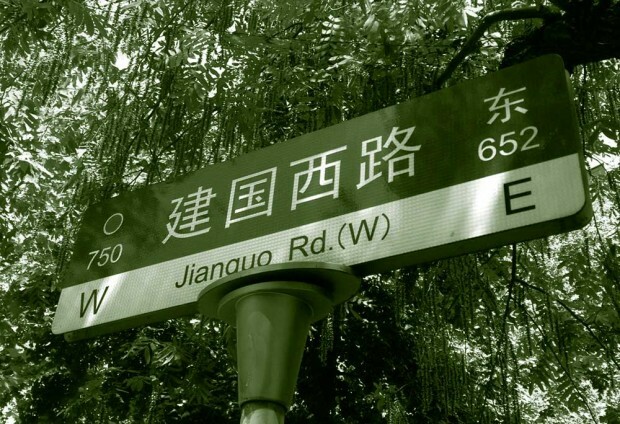 History | The Jianguo Street was once well known and his name was changing depending on the section, so that will list in the direction in which we show this experience, that is from West to East, it was the streets Route Frelupt y Route du Stand, Rue Conty y Rue Chevalier . The entire stretch of the route belonged to the French Concession, but the end of the street is just the border of the ancient Chinese city that once was surrounded by a wall (explained in the Urban Experience 02). The west side of the street, or current Hengshan Road, begins where the confluence of one of the most important arteries, as was Avenue Petain. Very near the confluence of streets was the “Post de Police Petain”. The street is known mainly for being residential at that time already, and at its western part were built the Dauphiné apartments, in the stretch further east was erected the French Concession Jail. Nowadays | It is a street of an average flow of traffic in all areas through which runs the city. It is a street that has mainly one direction, except at the end, East, which happens to have two directions. Throughout the street we can say that is quite busy and medium traffic. This makes it an artery for residents of these neighborhoods by bicycle and motorbike because is running parallel to Zhaojiabang, which is the high and rapid transit cars and trucks way. This is another avenue that almost everyone uses to get to the Nanpu Bridge. Therefore this street is very relevant at the district level but little for overall Shanghai. In almost all sections has a high flow of local traffic, especially motorcycles and bicycles but less neighbors cars. Bikes and motorcycles can make all the street in both directions. The width of the street varies but usually never less than two lanes in one direction only, except in the far east, it becomes a neighborhood street but double rail return. Because of its scale it is busy by pedestrians, has many mature trees giving good shade in summer. Urban Relevance | The importance of this axis in this part of town is high because organizes local traffic of average speed (several bicycles and motorcycles but fewer cars). Its function as a link between different highlights of the city and its history give great importance in the three neighborhoods that runs with the buildings and the average residential scale. Its sidewalks are rather narrow but are used only by pedestrians. It is in resume a street with constant and high traffic, lower urban relevance and much local use.